US President Donald Trump's National Security Adviser, Michael Flynn, has put Tehran on notice in response to recent ballistic missile testing. In a highly unusual step, White House Press Secretary Sean Spicer interrupted a White House daily briefing with media to pave the way for President Trump's National Security Adviser Michael Flynn. Retired Gen. Flynn took to the podium to announce that the United States is "officially putting Iran on notice" due to its recent missile test and attack on a Saudi military ship by Houthi fighters in Yemen. The missile testing combined with the Houthi attack, "underscore what should have been clear to the international community all along about Iran's destabilizing behavior across the Middle East," Flynn said. "These are just the latest of a series of incidents in the past six months in which Houthi forces that Iran has trained and armed have struck Emirati and Saudi vessels, and threatened US and allied vessels transiting the Red Sea," according to Flynn. Footage of the attack was shown by Arab TV channels. In the video, Houthi rebels celebrate hitting the vessel by crying out, "Allahu Akbar! (God is great!) Death to America, death to Israel, a curse on the Jews and victory for Islam!" Trump has "severely criticized" deals between Washington and Tehran, such as the nuclear arms reduction deal, in addition to the United Nations, Flynn said, adding that the agreements have been "weak and ineffective" while warning that "Iran is now feeling emboldened." As of February 1, 2017, the US is "officially putting Iran on notice," Flynn concluded his remarks. Iranian Defense Minister Hossein Dehghan previously verified that Iran has tested a new missile but claimed that the missile exercises did not violate the Iran nuclear arms deal with the US, China, France, the UK, Russia, and Germany. 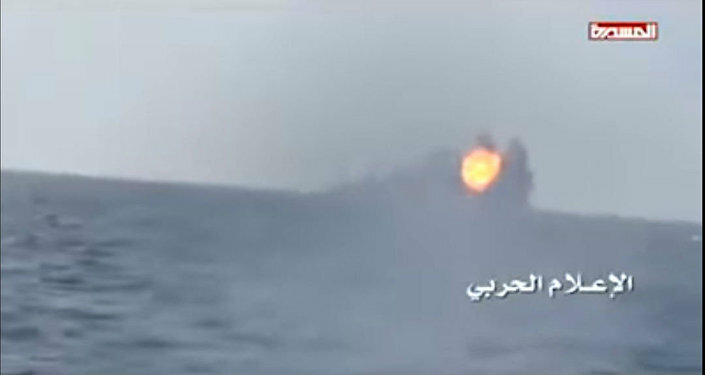 US defense analysts believe that the attack on the Saudi ship may have been a "dress rehearsal" for a similar-style offfensive against US Navy ships stationed throughout the region.